Would you believe that on this day (December 11) in 1894 the world’s first auto show was held? Four companies displayed a total of nine vehicles at the Internationale de Velocipidie et de Locomotion Automobile in Paris. This show evolved into the very famous Paris Auto Show that is still held today. Today’s auto shows are, in my opinion, too much about cars that companies want to sell you and not enough about concept cars. I don’t know when the emphasis changed, but I remember attending auto shows with my father in the 1960s and 1970s where many of the cars were concept cars. I really wish I had some of the picture postcards from those events. From chevroletcorvetteusa.com comes the photo above. The first Corvette was revealed at what has become a legendary event in GM history, the Motorama of 1953. That event was held in New York in January. (The GM Motorama was actually held from 1949 to 1961, but the 1953 show introduced the Corvette as well as other famous GM cars like the Buick Wildcat concept car whose name was used for later production models.) The modern New York Auto Show is held in April. 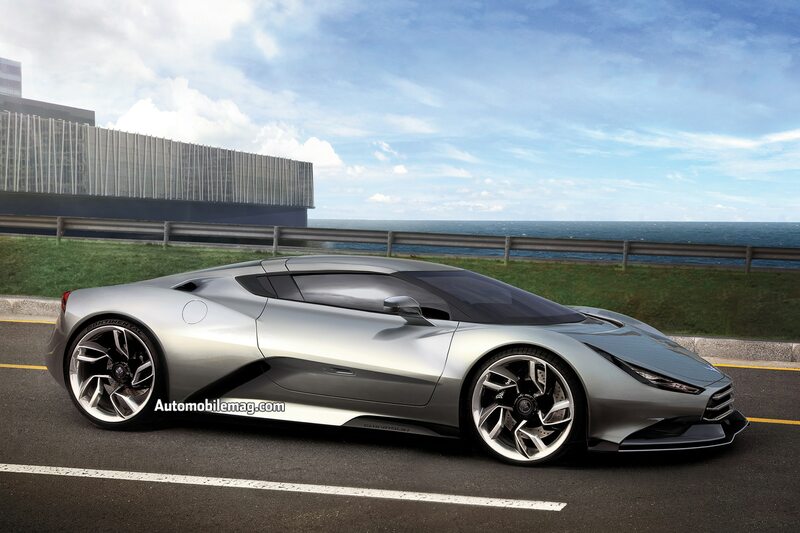 Could GM/Chevrolet be waiting until then to reveal the C8 Corvette? Do you think Chevrolet risks turning the car into a joke because of the delay in the introduction? For some reason Hemmings refuses to publish my comments on how obesity is, in my opinion, the primary culprit in the extinction of the American car. I simply write that 70% of American adults are overweight and cannot get in and out of cars easily so that have moved to SUVs and pickup trucks. I don’t think that’s especially inflammatory, but apparently their editors do. Well, I can write that here and have on many occasions. What do you think? Next Post Wednesday Cappuccino, Anyone? Speaking of Concept (or as we once called them “Dream Cars”), I saw the Packard Predictor at the Texas State Fair in 1956. Years later, I learned that the car was en route to Houston to legendary Packard dealer Wendell Hawkins. Packard needed more dealers like Hawkins (and DuBois in the Virginia suburbs of DC) who knew how to sell cars. When Packard announced they were ceasing production in Detroit, Hawkins snapped up every new Packard he could get his hands on. I completely agree with you about the reason many Americans shun sedans and have switched to SUVs and trucks. I’m not surprised that Hemmings won’t publish that. I’ve had my own issues with Hemmings playing censor. I’ve tried to post comments critical of Pat Foster. Some of Foster’s writing is OK, but when it comes to Packard’s James Nance and Nance’s herculean efforts to turn Packard around, Foster has an unnatural hatred of Nance that colors his writing about Packard in the ’50s. Foster never lets the facts get in the way of the spleen he likes to vent about Nance. Hemmings won’t publish any comment critical of Foster. Thanks again, 56packardman. If my “attempted” comments for Hemmings were profane I could understand. (I wouldn’t send profane comments, anyway.) Exogenous factors affect all aspects of life; the automobile market is not immune. The obesity of America, without a shred of doubt, has played a major role in the shift in the market. Refusing to publish comments about that will not make the problem go away. Biggest reason is many SUVs are based on car platforms. There is little separation in the mass of copies of this or that. As for the mid-engine Vette….they only have 1 shot at this, get it right and the world rejoices. Get it wrong and it could have ripple effects down the line. If they put out an unfinished, non-capable mid-engine design they will be a laughing stock. Hence, delays will ensue. After all, it was nearing production before GM realized that the stopping force of the z28 Camaro was so fierce that the tires actually rotated on the rims during extreme braking! Took a bit of time to come up with a solution for that to appease the car gods…..simply roughing the internal bead grab edges. I think both versions can coexist so long as they are similar, but different. Therein lies the big “catch” for all automakers. Imagine the person whose garage door opens to reveal a front, mid and hyper-electric Vette some day. Yes, of course GM/Chevrolet risk a lot if the C8 is released before it’s ready. GM took a lot of deserved grief for basically using its customers as beta testers for a long time. Still, it seems as though the process to develop the C8 is taking a LONG time. Regarding your comment to Hemmings, political correctness has overrun our society and infringes on our freedom of speech. I will descend from my soapbox now. The reasons for the choices people make in car models are many and do include the person’s size and comfort in being able to enter and exit a vehicle, hence our personal choice in a Dodge Journey.SUV. Also, when you need to transport a walker for your spouse, it is easier to put it into an SUV rather than wrestle with trying to get it into the mini- trunk of most modern day sedans. Federal regulations and the structures needed to build a “crash resistant” car effect the design and size of the trunk, or “boot” as our English cousins refer to that area. I think I have expounded upon this topic enough.